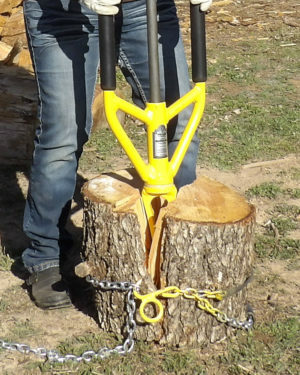 Splitz-All vs Mechanical or gas powered log splitter. 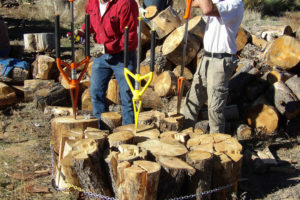 The Splitz-All is for the person who doesn’t want to fork out the $1500 to $5000 to purchase a gas powered log splitter. It is to help reduce the amount of bending and lifting a person would normally do with other methods. 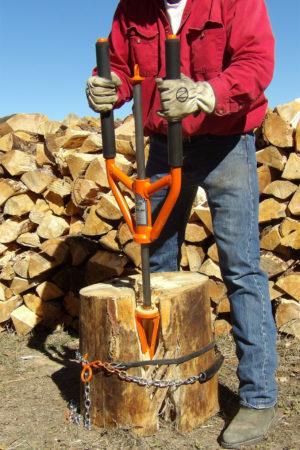 With the gas powered or mechanical log splitter you are required to lift the full weight of the log up to the log splitter, then bend and lift the now 2 pieces back up to split again. Then repeat to get the log size you want. That’s a lot of back strain. Not to mention the dangers of loosing fingers. With mechanical anything there requires a cost of fuel or electricity, and not to mention mechanical maintenance. What happens when you run out of fuel, or if it’s electric and, the power goes off, then the log splitter is of no use and can not split when you need wood cut for your fireplace. 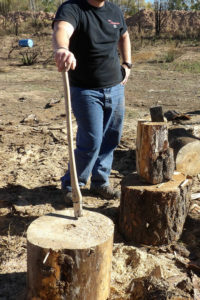 The Splitz-All is for the man who still likes a little bit of a workout while splitting wood, the woman who feels empowered to split her own wood and doesn’t have to wait for her husband to come home, or the single woman can now have a fireplace because it’s easy to split wood. The Splitz-All it also empowers the children, as well. What Dad could only split before, now the 6-7 year old can split. Splitz-All vs Traditional Manuel wood chopping methods. What about the dangers of the traditional ways of splitting wood. If you miss, the ax or maul head can cause damage to your leg. How about straining your back? With traditional splitting you are continually twisting, bending over and tweaking your back. When the ax head gets stuck in the log, you have to lift the full weight of the log up and over your head to get the momentum to slam it down to split it. If it doesn’t split the first time, then repeat until the log is split. Danger of traditional wood splitting. The ax head came off. Good thing it wasn’t in mid swing. What about having people around, while you split wood. Not a good Idea. There is danger within,(what someone else called), the blood zone. The full area of which the operator is swinging the ax. There are wood chips that fly into the air, there has been metal chips break off of the wedge that have flown and embedded into one individuals leg, causing massive bleeding and eventually death. Then there is the loose ax or maul head coming off the handle, that’s happened a few times in my experience. Once it comes off, it’s really difficult to get it placed back on, without the danger of coming off again. I’ve heard of stories of the head coming off and slamming into the windshield of the car…lets hope that’s all the damage it does and that the ax head doesn’t hit and hurt loved ones. The list goes on of wood cutting accidents. I’m sure you could come up with some of you own. What is the safety of your loved ones worth to you? Why is the Splitz-All priced where it is? 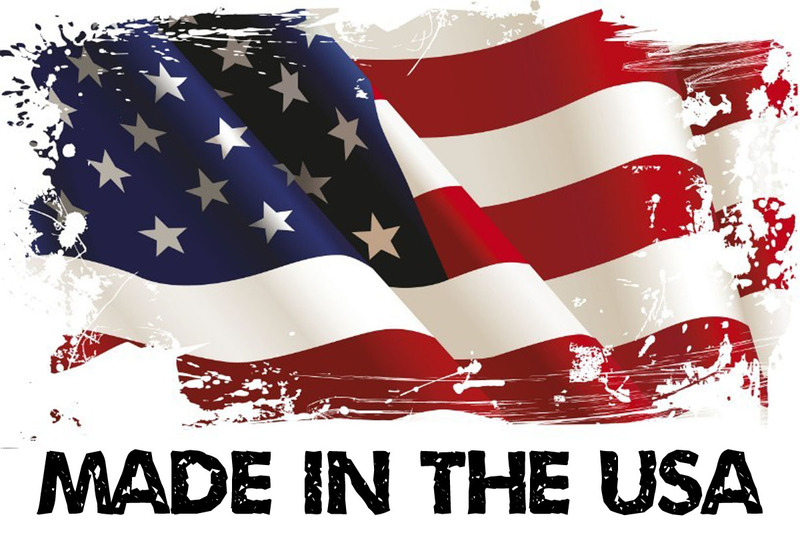 With traditional wood cutting, you have many tools to purchase separately to complete the job. An ax, sledge hammer, a few wedges, and maul. If at any time you over reach and hit the handle on the log instead of the wedge then the handle shatters and you can’t complete the wood splitting job until you go purchase another ax or maul or whatever got damaged. So with that said I think, you get the picture on why the Splitz-All is beneficial in many ways. First of all, It’s an ALL-IN-ONE tool. You only need one tool to complete the job. The price point at this stage is for low volumes. The price may vary and lower depending on order volumes. However, we have tested the tool and listened to people who have owned the cheap $40 -60 one handed slide hammer tools and said they were junk because the slide tube would break after a small amount of use, because of the low cost pipe. Our tools have high quality, hard alloy thick steel pipe for the slide tube, which costs more than just a pipe and very strong steel for the wedge which is 1-1/2 thick material used by our local “Crushing” company to crush rocks in the Crushers they build. We feel we have a quality product.